One of our regular customers is Dave. He moors his boat ‘Rumpleteaser ‘ south of Banbury. 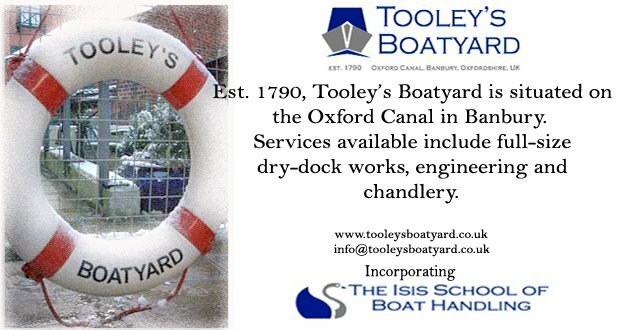 I will always remember the time that he brought his boat into the dock here at Tooley's. 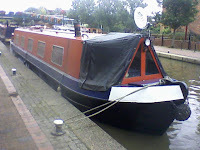 Narrowboats are normally flat bottomed but nobody knew that Dave's boat had a 1" wide fin on the bottom of his boat and when we drained the dock the boat was perfectly balanced on the fin and it looked like his boat was floating 10" above the ground. Well we have all been working long hours recently, so Matt M and I decided to get off early at 4pm (as we both travel in the van together). Then the phone rang. It was Dave off of NB Rumpleteaser. He told us that he was worried about some water in his bilge. When someone says that they are getting water in the bilges it’s normally from rain water, a leaking water system or a leaking stern gland, but when we got to his boat we realised that it was far more serious. There was water trickling down inside the boat from just below the waterline. We advised him to move everything to the other side of the boat to create a list to get the hole out of the water. We then contacted the next customer and managed to squeeze Dave in for an emergency docking. We found that there was what looked like a 8” crack, and the metal in that area had thinned to around 1.5mm thick. So we welded a plate over the area to stop the immediate problem. We were still worried about a crack a behind the rubbing strake, so we re-booked Rumpleteaser back into the dock at the earliest time that we could arrange for the hull to be inspected. So we booked in Marine Surveyor Barrie Morse to inspect the boat in the dock. He found that the problem was restricted to just that area behind the rubbing strake. This had to be removed and the area welded. Now that his boat is watertight, we reckon Dave was lucky (he may not think so) that he spotted the problem before it was too late. It highlights the importance of trying to keep your bilges as dry as possible- not only does it stops the boat rusting from the inside but you can also see when you have a problem.